The First Siphonic Drain Retrofit in Las Vegas Valley - Jay R. Smith MFG Co. The Las Vegas Convention Center (LVCC) has an estimated impact of $1.6 billion on the southern Nevada economy annually. Hardly a week goes by that the Convention Center is not hosting a meeting or trade show. The LVCC hosted 1.2 million visitors last year alone. So, when the convention center has an issue with the plumbing, they can’t simply shut down for a few days or weeks for construction crews to fix the problem. The original LVCC was built in 1957. Since then it’s been expanded into the building it is today, which encompasses approximately 3.2 million square feet. Recently, fatiguing drain lines presented a serious problem should they cause flooding in the expo halls. The convention center turned to Love Engineering to figure out a way to solve their problem without disrupting any of the upcoming trade shows using their space. Korin Carter, project manager at Love Engineering, the on-call engineers for the LVCC said that going underground was not an option. The exhibit halls, grand concourse and back of house offices all sit on that original underground pipe. Shows are booked two and three years in advance so there is no downtime to schedule construction. The only option was to go overhead and deal with the slopes required with a traditional piping system. That’s when a siphonic system was suggested. A siphonic system would reduce the size of the pipes and eliminate the requirement for sloping. It was a more favorable installation and the first of its kind for a retrofit situation in the Las Vegas valley. “The choice to go in that direction was probably one of the most prudent choices I’ve seen made in a while. It doesn’t take up a whole lot of space. It’s very easy to compensate for the turns and twists you have to make in an existing building,” said Carter. 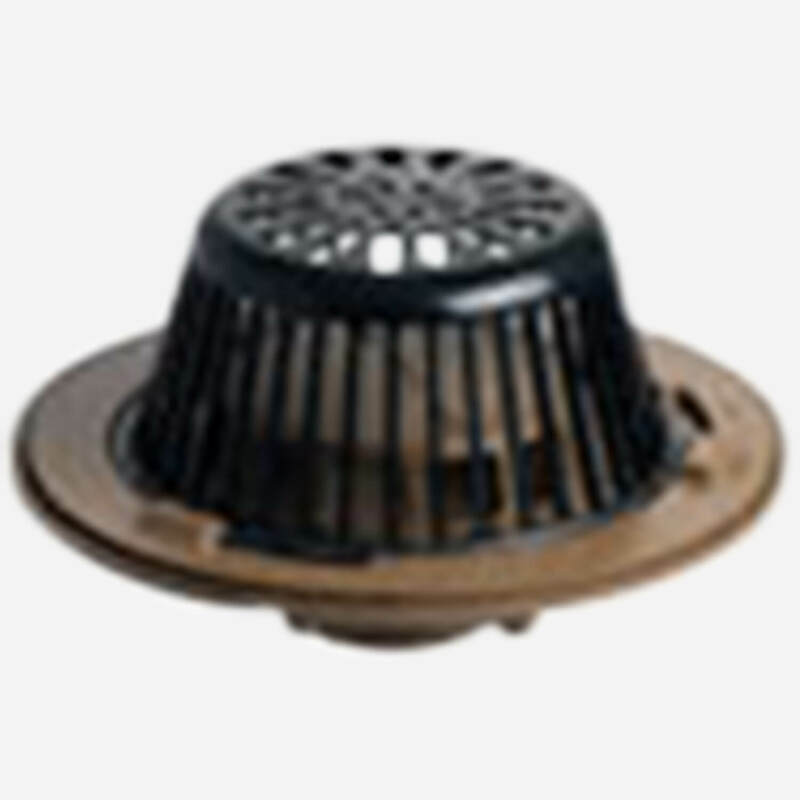 The Smith siphonic roof drains (IAPMO listed) have unique air baffles that inhibit the admission of air into the piping system, allowing the piping system to fill completely, or prime, with water. Once the system is primed atmospheric pressure begins to push the water into the drains with a force of 14.7 pounds per square foot. The siphonic system makes full use of gravity in the vertical drop. Without the presence of air, water moves much faster than the channel flow of a traditional system. Because of this the same amount of water can be carried off the roof through smaller piping at higher velocities. As a result, the cost of piping can be reduced by up to 40 to 50 percent over a traditional system. Once the decision was made to go with a siphonic system, a call was put into Jason Shirey, the local Elmco Stewart representative, and Shirey rallied the experts in siphonic drain systems at Jay R. Smith Mfg. Co. Working closely with Southland Industries (the contractor), and Love Engineering, Shirey and Smith were able to put together a package that met the LVCC’s requirements and shipped in time for the start of construction. “Southland Industries, was fantastic. I would use them again for this type of project. They were very attuned to what was going on,” said Carter. She pointed out that they didn’t just rely on the drawings they were given. They uncovered some problems that were not seen during the walk through and worked with everyone to make sure the system would work correctly. Carter said she hopes with the success at the Convention Center, other clients will be open to installing a siphonic system. She felt that a siphonic system installation would be particularly appealing for large warehouse buildings and projects where the plan is to flatten a roof or to put in roof drains. Especially if walls were built up where the roof drains run down and are, for whatever reason, not working. “The cost to cut concrete to run to the storm culvert is astronomical. If you can get it to run in a different way and if the piping is smaller, it’s a huge plus. You're talking about cutting costs considerably for not any more work really,” said Carter.